The cross-country drive would not be the enjoyable, sight-seeing trip I wish it could be. Instead, it would be rush, rush, rush since I was so far behind schedule. Todd, like any other truck driver, would drive as far as he could go in one sitting. Not being a professional driver, I knew there was no way to keep up with him. I would have to go s far as I could and hope that I could stay on schedule for a Thursday unload date. I had previously made arangements with a storage facility in Reno. Nevada has some very interesting tax laws, so warehousing is big business there. Furthermore, few houses have basements, so most people have to use at least some self-storage. As a result, self-storage units were plentiful and reasonably priced. Now, for this project, not just any storage facility would do. The most likely candidate would be an industrial warehouse, who had the necessary tools (forklift, etc.) to handle this sort of load. However, these types of facilities like to use their own laborers, and the amount of loose stuff would make this challenging. (They prefer everything to be neatly palletized, or otherwise set up for easy handling by forklift.) So, I was very happy to find a facility that both had the necessary equipment for the unload, and was otherwise a self-storage facility. The people there were very pleasant, and they seemed to understand my problems. I reserved two 10 x 20 foot spaces from them, and was within budget for storage. One thing I really wanted to do bad was stop at the Field Museum of Natural History in Chicago to see the Tsavo Maneaters and some new exhibits they had just opened. Luckily, Todd also planned to spend some downtime in Chicago to have dinner with a good customer of his services. This would buy me just barely enough time to visit the Field Museum. Knowing that I had a very challenging timetable to keep to, I made a very surgical stop in Buffalo. One thing I quickly learned is that Buffalo's street numbering system is really wierd, so I ended up on the wrong end of a very long street. Still, I managed to find the place where the VPR-6 was. I nearly ran into the machine, which was parked in the front entryway of the building. even though I was running with a pretty full load, I had no trouble getting the VPR-6 and all of it's acessories into my truck. 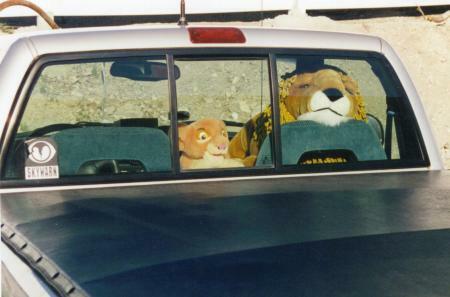 I also had a fierce lion to watch over it as I travelled! I paused long enough to have a nice talk with the man who had sold the machine. He had some interesting video stories to tell! Soon, however, I was underway again, almost exactly on schedule. I had left Rochester on Interstate 90, which would take me through a small part of Pennsylvania and into Ohio. The detour in Buffalo was a short hop off of and back on to Interstate 90. As I passed through the West barrier tollgates at the NY/PA border, I said 'goodbye' to both New York, and it's high tolls! I stopped from time to time to try to reach Tom and let him know I had the machine. I could not get through. I also called Todd to find out how he was doing. From him I got distressing news: He ws overweight! Turns out our 'eficient' pack job had been too efficient. The driving axles of the tractor were overweight by about 3,000 pounds. I also knew that there was no easy way to rearrange the load should he get stopped at a weigh station. So, I prayed that he would miss the weigh stations. Todd tried to stay within weight by running a minimal fuel load, and moving some heavy tractor acessories to the back of the trailer. This meant extra stops for Todd, as he could only carry a quarter load of fuel. Although I knew this would all work out through the Lord, I was still very concerned. Otherwise, the trip was remarkably smooth and uneventful. After a long construction slowdown just outside of Rochester, I encountered almost no additional construction all the way to Chicago. This took at least half an hour off of the driving time. After getting into Ohio, I took the bypass around Cleaveland, and made it on to Interstate 80-90. For the rest of the trip, I would be on or near Interstate 80. Somewhere in Ohio, or maybe Indiana, I encountered a unique pet exercise area. Apparently, the rest stop area operators knew you needed a place to walk and water your lion, etc! So, they built this heavy cage with a water fountain so you could service o you could service your lion, etc. in perfect safety! About 5 hours outside of Chicago, I finally managed to get a hold of Tom. This was perfect timing for him, and we would meet at a favorite hotel of mine near the junction of Interstate 80 and Halsted street. This is on the extreme South end of Chicago. The drive cotinued to be flawless. Praise God! I finally arrived in Chicago, and got a room in the hotel. First thing to do after getting in the room ws to call Tom. Turns out he was just 5 miles away, still on his way in. Perfect timing! I also called Todd, and found out he was just 3 miles away at a truck stop. (In retrospect, we could have driven over to the truck stop, and put the Vidifont on the truck, hd Tom brought it. Still, Todd didn't need any more weight on his overloaded truck!) We exchanged equipment in the hotel parking lot, and then went out to dinner. Tom brought along his wife, who I had never met. It was a really special time. Despite Todd's being in Chicago, I knew I was still on a very tight timeline. After doing some agonizing calculations and refinements, I determined I could spend exactly 90 minutes at the Field Museum. Just enough time to get a good look at the three exhibits I wanted to see. I timed things to arrive at the museum just after it opened. I got lost getting to the museum, as I had missed an exit. Luckily, I knew that area of Chicago well enough to get back on track without a map. As it turns out, getting there early was a good thing. I got a parking spot in the small museum lot, rather than in the moderately distant Soldier Field parking lot. The three 'must-see' exhibits were the 'Tsavo Maneaters', the 'Maneater of Mufwe' (New) and 'Sue' (also new). Even though I had seen the Tsavo Maneaters three times previously, I always learn more every time I visit. This time, they had a video kiosk set up near the maneaters explaining some of the research being done to determine the cause of manelesness among Tsavo lions. I also was able to get some new close-up photographs of the infamous lions, now that I have a camera with a long lens. If the subject of the Tsavo Maneaters interests you, check out my extensive Tasvo Maneaters website. 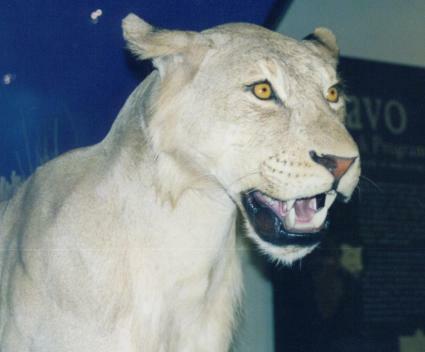 The 'Maneater of Mfuwe' is a new maneating lion, just put on display at the Field Museum. He was shot near Mfuwe, Zambia in 1991. He has the distinction of being the largest maneating lion ever recorded. Just like the Tsavo Maneaters, he is a maneless male. 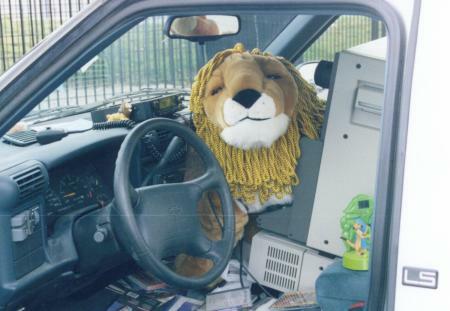 It is also the most impressive lion mount I have ever seen. Despite it's odd location under a staircase in the lower level, the location lets you view the lion from almost all angles. The last exhibit I wanted to see was 'Sue'. Sue is the largest Tyrannasaurus Rex fossil ever found, and also the most complete. It is a truly awesome sight! The recovery and mounting job is simply state-of-the-art. As the museum's most popular exhibit, there was a large crowd there to view it. It was so large, that there was also plenty of room for everyone! There were docents all over to answer people's questions, and supplies of mounted cards that allowed you to interpet the exhibit for yourself. One part of the Sue exhibit that is not real is the skull. The skull on the mount is a reconstruction. The actual skull is in another case, mounted where you can get a really good look at it. It was also somewhat mishapen, so it didn't look quite right on the otherwise perfect mount. In any case, one can get a real appreciation for how fearsome these animals must have been. I stopped in the gift shop just long enough to pick up some new 'Tsavoware' and a 'Sue' shirt. Outside the museum, I paused long enough to get pictures of the antenna masts on Chicago's two biggest skyscrapers. 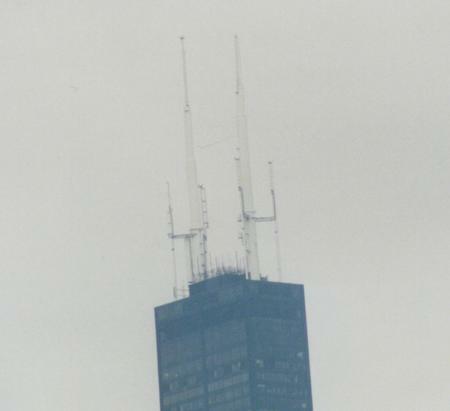 The Sears Tower (pictured above) just recieved the short masts you see a few months ago to accomodate Digital TV antennas. It ws quite a job to get them up there, involving several harrowing helicopter lifts. Avoiding the same mistake I had made coming in, I quickly exited the Chicago area, heading Southwest on Interstate 55. After quite a few miles of difficult driving through heavy road construction, I met wp with Interstate 80. Then, it was just drive, drive, drive! 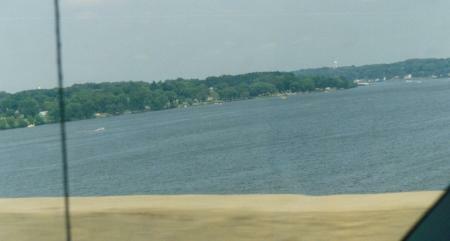 It didn't take long to reach the Illinois-Iowa border and the Mississippi River. I just held up the camera and snapped this picture as I crossed the most significant East-West divider in this country. (Only 13 years earlier, I lived on an island in the middle of the Mississippi!) Not too far into Iowa, you encounter another marvel: The Iowa 80 truck Stop. it is supposedly the largest truck stop in the world, and the endless sea of 18-wheelers around it seemed to confirm this. This truck stop has everything a truck driver could ever want, even a dentist's office! There were several gift shops to wander through, and a heavy-duty parts shop. I wanted to get Todd something, but the selection was so ovwewhelming I couldn't make up my mind! After getting something to eat, it was back on the road. When I got just West of Des Moines, I was now further West than I had ever been travelling by road! I savored the thought for just a moment and kept on driving. i wanted to make it at least as far as Omaha, Nebraska that night. I longed for a juicy, hanging-off-the-edges-of-the-plate grain-fed Midwest steak. Unfortunately, the steak never materialized. I finally stopped at a truck stop that had a steakhouse. I was shocked and appalled to find out that they were out of steak! Completely frustrated and dismayed, I kept driving on. I never did find a steakhouse that night. I stopped at another small truck stop for dinner, but no one there seemed interested in serving me. So, I left and kept driving. Hungry, frustrated and exhausted, I finally stopped for the night in Kearney, Nebraska. I ate at a nearby Perkins Restaurant (Pancakes! ), and then caught up with Todd. He was planning to drive straight through to Evanston, Wyoming. There, He would stop and pick up some furniture for his wife. The next morning, I was quite refreshed despite the frustration of the previous evening. I serviced the truck (Still running flawlessly), and headed West. nebraska is not the flat place you are led to believe it is. It is a beautiful place, with lots of gentle, rolling hills. Everywhere, there were herds of beef cattle. Some herds were small. other were huge. Looking at them stirred up the 'lion' in me and made me hungry! In the extreme Western end of Nebraska, the land started to become hilly. Not long after I crossed the border into Wyoming, the road started a long upgrade. I was driving into my first mountains! As I reached the summit, I learned that this area was called the Sherman Mountains. I stopped at an overlook in the middle of the freeway, where a tree seemed to grow out of a rock. 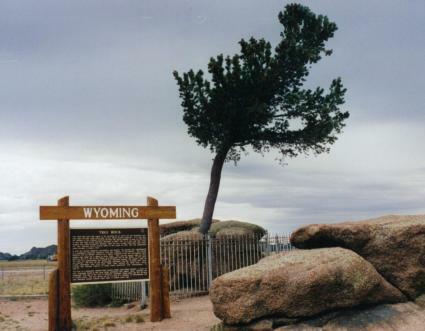 Turns out that this tree was discovered during the construction of the Transcontinental railroad. They actually diverted the railway several miles to pass by this interesting curiosity. (Interstate 80 follows the original course of the Transcontinental Railway for much of it's traverse through Wyoming.) The tree has been growing there for at least 1,800 years. The rock itself is very coarse-grained granite. I continued to drive across Wyoming, admiring the stunningly beautiful landscape. it was also incredibly desolate in spots. This was definitely open country! I eventually reached Evanston. I stopped at a Truck Stop and had a brief snack. It was just before nightfall. I didn't particularly like the idea of staying in Salt Lake City overnight, or for that matter even stopping in Utah. Being over 200 miles across, I decided to 'go for it' and cross Utah that evening. Todd was planning to keep going and would be in Reno by the time I got up the next morning. I fueled up the vehicle, got on the freeway, and headed West. I now encountered my first really steep upgrade, followed by an incredible downgrade! By the time I hit the downgrade, I was into Utah, and it was dark. I ended up missing a lane change on the Interstate, and was forced to exit in the middle of nowhere. Having no detailed maps of the Utah backcountry made this a big challenge (The exit had simply been labelled 'ranch road', and there were a number of these exits.) Getting back on the expressway did not look possible at this point. So, I prayed. God told me to simply follow the road I was on. It was a narrow, steep, twisty road that followed a cliff of rock. It also paralleled Interstate 80 and a railroad. After what seemed an eternity, I finally reached a freeway entrance ramp. I found myself right at the junction of Interstates 80 and 84, on the steepest downgrade I have ever driven! It took all the concentration I had to drive this dangerous road. 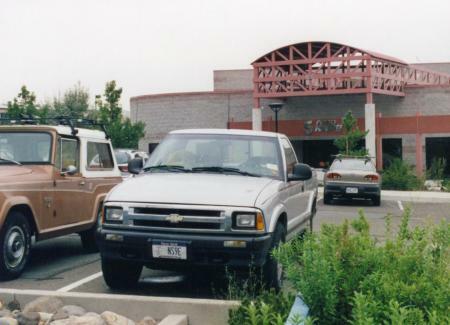 As I got closer to Salt Lake City, it became apparent that there was a massive road construction project in progress.Interstate 80 through the city was closed, and you were advised to take the really long way around the city on Interstate 215. Even this had it's moments of construction. However, I started to see road signs that made my heart leap for joy: 'Reno'! As soon as I was back on Interstate 80, I passed a huge plant of some sort. It had towering smokestacks and was lit up like a Christmas tree. I never did find out what it was. The road then became long, and ramrod straight. The lanes were poorly marked, so it took a lot of concentration to stay in my lane. But, the further I got from Salt Lake City, the better the driving became. For several miles, the road ran along the shore of Salt Lake. There I smelled a smell I had smelled in only one other place: Among the Alkali Lakes on the South end of Serengeti National Park in Africa. Salt Lake was the same kind of lake. Before too long, I was out onto the Bonneville Salt Flats, West of Salt Lake. Eventually, I came upon the entrance road to the Bonneville Salt Flats Raceway, one of the most famous raceways in the world. 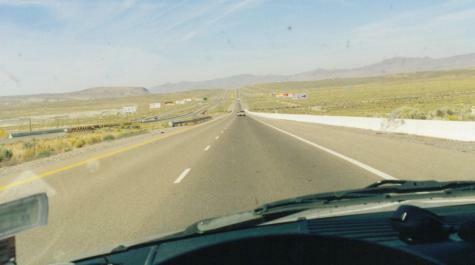 The goal was to make it into Nevada that evening. Not long after passing the raceway, the lights of Wendover, Nevada came into view. Although I thought of driving further in to the state, I decided to stop. I was dog tired. I took the first exit inside Nevada. The very first thing I see: Casinos everywhere! Their bright lights were actually painful to look at at that hour of the night. I did not have to drive far to find a hotel to stop at for the night. It was just a little bit off the strip, in what appeared to be a quiet neighborhood. I stopped and booked a room. Then, I found out why it was so quiet there. I was back in Utah! The state border runs right down the middle of Wendover. One side has casinos, the other does not. I was just 300 yards outside the border! In the lobby of the hotel were lots of pictures of various race cars built for the Bonneville Salt Flats. Many attemps had been made there to break the land speed record. The hotel clerk told me that there had been a big race on the salt flats just the week before. The next morning, I got ready for the final assault: the drive across Nevada! I had done so well the previous days that I only had about 450 miles to drive. That should put me in Reno early enough to stop and say 'hello' at KNPB. Before I left, I took a picture of a couple of really fierce guards who had protected my truck on this long journey! The other thing I had not been able to see at night: Wendover is an incredibly beautiful place. It is hemmed in by steep, jagged mountains on many sides. it was something I would see lots more of before the day was over. Soon, I was headed West. I stopped briefly for breakfast in Wells. The most amazing thing, especially in the Eastern half of the state, was how long and straight the road was. this picture is typical of many sections of 'endless road' I drove that day. but, the road held lots of surprises. After driving a long stretch like this, you would reach a serious upgrade or downgrade. 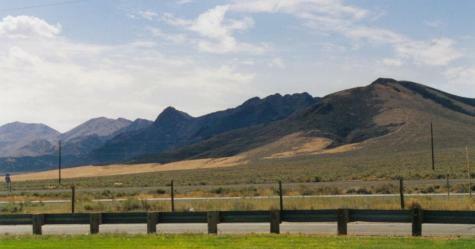 There were several named mountain passes the Interstate passed through on the way to Reno. In fact, it took a huge detour to get around one big mountain range. At the Northmost point on this detour, I stopped at a spot called 'Button Point'. I took this picture of the Sonoma Mountains which were very beautiful at this place. the picture does not do it full justice. I also learned that this was an important spot on the 'Emigrant trail'-- one of the many routes that people travelled to get to California during the Gold Rush days. From that point on, I longed to make it to Reno. I soon passed on to the Carson Sink, which was also known as the '40 mile desert'. This alkali flat was about the deadliest spot along the Emigrant trail. The bones and goods of many people and animals are scattered out in that desert. There are also hot springs in that desert. So hot in fact, that there are steam wells drilled into them. They generated electricity with this steam, and performed other industrial processes as well. I have since learned that this whole region is volcanic, and you can get geothermal heat most anywhere by drilling a deep well. (Many people have.) i also saw a brush fire in progress, and a smelting plant for some mine. At first, I thought the stink I smelled there was the smelting plant, but it was really the brush fire. Just before I reached Fernley, I saw a sign pointing down a side road saying something like 'Rochester 5 miles'. The thought crossed my mind that if I didn't like the job, I didn't have to drive far to go back to Rochester! After passing through Fernley, I hit a patch of really bad road construction in the Truckee River canyon just outside Reno. I lost a lot of time driving through this slowdown, and traffic was backed up for miles. The three worst construction delays I encountered on the trip: Just outside Rochester, just outside Chicago, and just outside Reno! Soon, Reno came into view. Since I had been out there for the interview, and had a rental car, I actually knew my way around a bit. Still, I made the mistake of taking a slow way to KNPB when I knew a faster way! But, I finally made it to KNPB. The time was 4:04 PM on Tuesday August 29th, 2000. Next: Getting Quadruplex Park stored away, and then seeing some of the sights of Reno! Next chapter: Settling in Reno!